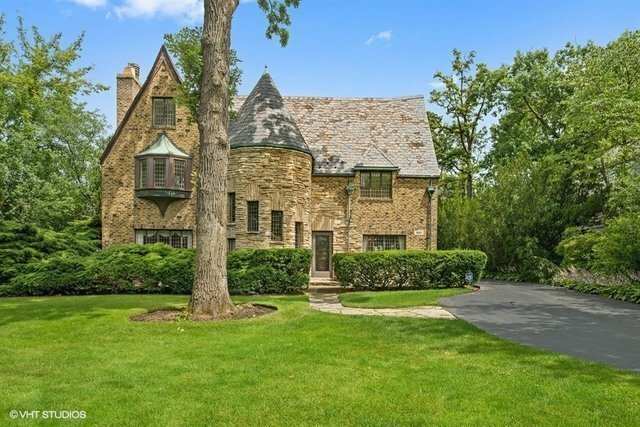 Fall in love with this magnificent French Tudor estate perfectly expanded and restored for modern living. Set on lushly manicured grounds with true privacy in an incredible walk to town, train, schools and lake location. Incredible Chef's Kitchen with white cabinetry, stone counters, 2 subzero fridges, 3 ovens and a sun-filled eating area open to a large family room with fireplace and wet bar. Exquisite Living Room and banquet sized Dining Room with elegant upholstered walls, perfect for entertaining. The Master Suite exudes true luxury with a sitting area, Juliette balcony, Spa-like Master Bath with heated floors, oversized steam shower, whirlpool tub and massive double closets. No expense spared with heated stone floors, sauna, gorgeous roof deck, pool and hot tub, slate roof, finished 3rd floor and basement, 3 car heated garage and so much more! Don't miss the opportunity to live in true luxury!! !